I was 9.5 months pregnant when my family and I threw my parents a surprise 30th anniversary party. I had offered to make the cake, but at two weeks away from my due date I wasn't exactly motivated to spend hours in the kitchen putting together the perfect cake. Therefore, I decided to use store-bought cake mix, but make an eye-catching design inside and outside to grab their attention. I also made homemade frosting, so that helped a little. 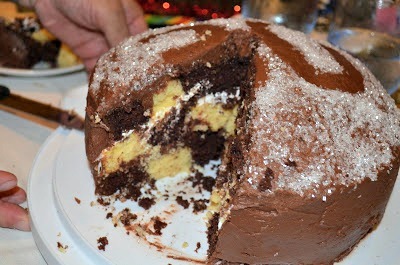 I made a checkered pattern in the cake, which was easy to do and looked really cool! Below are the instructions. P.S. Sorry the picture quality isn't the best, but you get the idea! Step 1: Bake two 9-inch cakes of two different flavors/colors (you will have 4 9-inch cakes total). Step 2: Cut a 7-inch circle out of a piece of parchment paper. 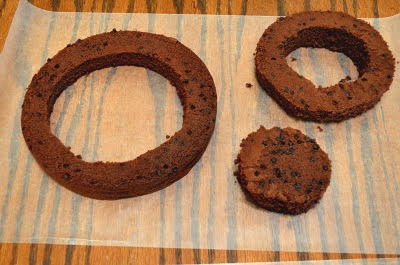 Also cut a 5-inch circle out of parchment paper. 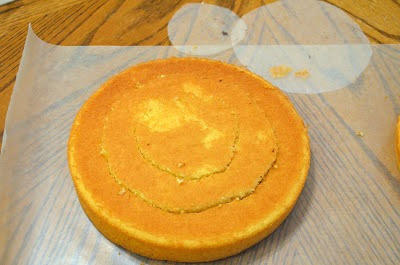 Step 3: Place the larger circle on each cake and cut around with a knife. 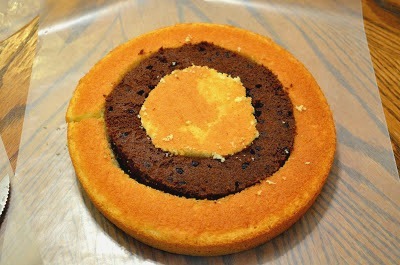 Place the smaller circle inside the smaller cake cut-out and cut around with a knife. Separate each piece. 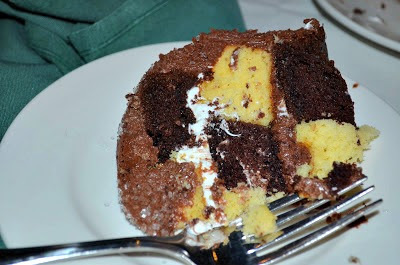 Step 4: Put each cake round so they are alternating colors (in this case, two of the cakes were vanilla, chocolate, vanilla and the other two were chocolate, vanilla, chocolate). 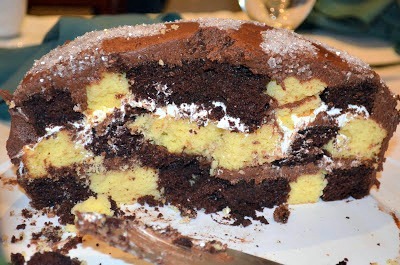 Step 5: Stack the cakes so the outer layer alternates in color/flavor (chocolate, vanilla, chocolate, vanilla). 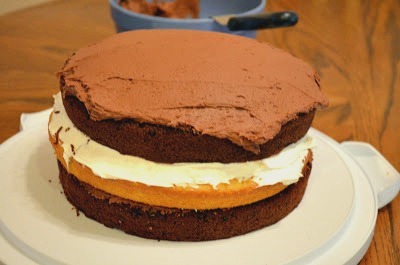 Make sure to spread some icing in between each layer! Please note I only used three out of the four layers since my travel container wouldn't hold all four layers). Step 6: Cut and enjoy! This obviously isn't the best picture, but you get the idea! Everyone (especially the kids) thought it was really cool!